To receive the Group room rate at the hotels listed below, be sure to mention the Strata Data Conference room block. Rates will be honored until 27 April 2018, or until the block sells out, whichever comes first. DO NOT go to the similarly named Hilton Tower Bridge. London has six international airports. If you are flying into the capital to attend Strata Data Conference at ExCeL, we recommend using London City Airport as it is less than a mile from the venue. Other airports are Heathrow Airport and Gatwick. From Heathrow, take the Heathrow Express to Paddington station (15 minutes). From Paddington, head south on the Circle line (yellow). Change at Tower Hill, walk to Tower Gateway station. Head east on the DLR towards Beckton. Get off at Prince Regent stop for ExCeL and Aloft London ExCeL. From Gatwick, take either the Gatwick Express or a Southern train to London Victoria. From there, take either the Circle (yellow) or District (green) line to Westminster. From there, take the Jubilee line (grey) to Canning Town. From there, take the DLR towards Beckton, and get off at Prince Regent stop for ExCeL and Aloft London ExCeL. Please note that if you are taking the DLR line, exit at the Prince Regent stop. 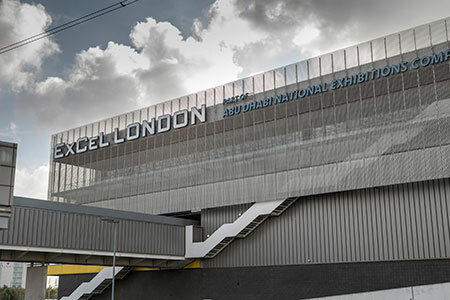 More information on how to get to the ExCeL by the DLR (Docklands Light Railway), London Underground, or other means of transportation. Heathrow Express Train - from Heathrow, takethe Heathrow Express to Paddington station (15 minutes.) From there, either take the Circle line to Tower Hill station or get a cab; average fare = £25. Metro/Underground - from Heathrow, take the Piccadilly line to Hammersmith. Change there to the District line, get off at Tower Hill Station. Journey time: 90 mins. Taxi - from Heathrow, average fare = £90. Journey time: 75 minutes.